Hobby store Hobby Point operates within Singapore’s Bras Basah Complex, at 231 Bain Street. 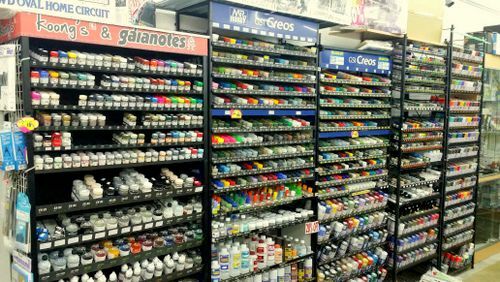 Established in 1995, Hobby Point specialises in retailing and wholesaling toys & collectibles, model kits, as well as tools (such as modelling paints) and accessories. Among the brands available at the store are Mr Hobby, Bronco, Academy, Sparmax, Koong’s, ICM, Dragon, Gaia Notes, Italeri, XM Studios, Revell, Bandai, Kotobukiya, Tamiya, Wave, Trumpeter, and Hobby Boss. The official Facebook page for Hobby Point is located at www.facebook.com/hobby.point.71/. Following the Facebook page, you’ll receive updates about Hobby Point’s new and upcoming products, their promotional offers, and much more.